I'm thrilled to announce the Paperback Release of this AMAZING book!! I read this book back in March and you can find my 5 STAR review HERE. See below for a synopsis of the book and an author Q&A from Brad Parks! Say Nothing isn’t your first novel, but it is your first standalone, and it’s a real departure in tone and style from your previous work. What compelled you to write this kind of thriller? After six books in a series, I felt like I was ready, creatively, to write something more ambitious. I was also ready emotionally. When I began writing my series, I was 30 years old, newly married, no kids. I had a job and a mortgage, yeah, but developmentally I was still in a kind of extended adolescence. All I really had to take care of was me. By the time I began Say Nothing, I was 40, a battle-scarred veteran of marriage, with two kids. A lot of the previous decade had been spent worrying about other people and their needs. Put simply, I’m no longer the most important person in my life. It’s a shift in focus that means every time I see my wife and kids hop in the car and drive off somewhere, I think, There goes my whole world, right there. That sense of fragility and vulnerability permeates Say Nothing. In Say Nothing, a federal judge is left doubting everyone he thought he could trust when his twin children are kidnapped and held for ransom. Where did this idea come from? An author buddy once told me you have to write the book that scares you. Say Nothing is me taking that advice to heart. My kids are Elementary-school-aged. I can think of nothing more terrifying than someone kidnapping them. From there, it was a matter of finding a character who had something compelling enough—besides just money—to motivate a kidnapper. A judge ruling on an important case struck me as just that character. Federal judges are notoriously publicity shy, so it was difficult to penetrate that judicial wall at first. But I was eventually able to find a judge who was gracious enough to let me into the world and talk with me about what the job was really like. I can’t reveal too much—I promised the judge anonymity—but I couldn’t have written the character of Scott Sampson without those insights. As for the family side of the novel, a lot of my “research” comes straight from my life as an engaged father. I confess I may have played some Baby Hippo in my time. Each character in Say Nothing has a distinct voice and their real motives are often counter to what Judge Sampson perceives. Did you find it challenging to create plausible doubt in each character? I love using analogies to physics, because there are only about twelve people on the planet who can tell me I’ve gotten them wrong and none of them will read this Q&A. So here goes: When I write, I treat characters as if they’re being governed by Werner Heisenberg’s Uncertainty Principle. They’re distinct atomic units—each the protagonist of their own story—bouncing against each other in seemingly random fashion. The more I turn up the heat, the more violent their collisions become. And we can never know their position and momentum at the same time. Which character was most compelling to write? I loved writing Senator Blake Franklin, Scott’s former boss and the lawmaker who nominated him for the federal bench. It’s a complicated relationship, because Blake used to be a mentor to Scott, but they’re now equals of a sort—except we’re never really on equal footing with our mentors. Their back stories are also tangled in ways that become more interesting as the novel progresses. Plus, in my mind, Blake Franklin’s voice sounds like the late former U.S. Senator Fred Thompson of Law & Order vintage: He fills the room with this big, booming Southern accent. Before you were a full-time novelist, you were a successful journalist. How does that inform your work today? One year at a daily newspaper brings you into contact with enough fascinating stories and weird characters to fuel at least twenty novels. It also teaches you how to learn (quickly!) about anything at all. One of my favorite cartoons shows a journalist aiming at a dartboard. Underneath is the caption: “Today I’m an expert at...” That’s how a guy like me, with no education in the law, ends up feeling perfectly comfortable writing a legal thriller. I miss the people. The newspaper newsroom of yore was a magical place: A collection of bright, talented, irascible folks—many of them temperamentally unsuited for employment in any other industry—who spent half the morning strangling each other and half the afternoon worrying about lunch. But then somehow by the end of the day, they managed to get their act together just enough to publish the equivalent of a full-length novel, complete with pictures, graphics, and the horoscopes. And then they’d get up the next day and do it all over again. It was magical to be even a small part of the whole crazy show. Why did you transition into writing novels? In some ways, the decision was made for me. The newspaper business began entering its death spiral around the time I turned thirty. I came to realize there was no chance I was going to be able to ride that dinosaur all the way to retirement. I took a buyout in 2008, when I was 34, figuring it was better to jump than be pushed. At that time it was frightening. And depressing. Journalism was all I had ever done, all I knew. But looking back, it’s the best thing that ever happened to me. Under ordinary circumstances, I am far too risk-averse by nature to do something as outrageous as leaving a steady job for the uncertainty of writing novels. It took the collapse of the industry to make me pursue a dream I otherwise would have been too chicken to chase on my own. What’s something about your process that might surprise people? How—for lack of a better word—physical it is. While I’m working on a novel, particularly in that crucial first-draft stage, I treat myself like a professional athlete in season. I do everything I can to maximize performance: I eat right; I don’t drink much (besides Coke Zero); I try to give my brain lots of rest, whether that’s goofing off in the afternoon, or getting eight hours of sleep at night. Don’t get me wrong, I have distractions, like everyone. But my goal is to structure the other twenty hours a day so that those four hours in the chair can be as productive as possible. Do you have any special strategies for overcoming writer’s block when it hits? I have developed a patented three-step process for dealing with writer’s block. Step One is self-loathing, wherein I think about all the ways in which I am the worst writer who ever lived, a total fraud who ought to do the world a favor and shoot himself rather than write another sentence (either that or go to law school, which would be even worse). Step Two is moaning to my wife about how awful I am and how this time—this one time—really is different from all the others. (Isn’t she lucky to have me?). Step Three is going for a long run, wherein I usually solve all my problems within about five miles or so. Then I come home and brag that I am the Toughest Man Alive. I go through this process a minimum of three to four times a week when I’m drafting a novel. My thighs are like boulders. What’s the most important trait you bring to the keyboard? Stubbornness. It’s the gas for my writing engine, and I’d like to think I have more of it than most. A small anecdote to illustrate my point: When my wife was in grad school, she had to learn how to administer intelligence tests and I served as her test dummy. Literally. There was one test—I think it was for second-graders—where you had to rearrange blocks. The scoring was a sliding scale based on how quickly you could complete the task. You didn’t get any points if it took longer than two minutes, but the test administrator couldn’t tell you to stop. I kept fumbling with those stupid blocks for twenty-six minutes before I finally solved that second-grade problem. But that’s the great thing about writing. There’s no stopwatch on you. I may not be the smartest guy in the world, but I am willing to bash my head against the screen until the words come out right. Think of LeBron James naked. I used to be a sportswriter, so this is less theoretical for me than it might be for the kids. Trust me: LeBron owns a very impressive example of the human physique. And he didn’t get that way by sitting in a coffee shop, telling people he’s got some really good ideas for how he’s going to become a basketball player someday. He works his tail off. Writing is the same thing. It’s a muscle. You have to exercise it every day—vigorously—if you want it to be strong. 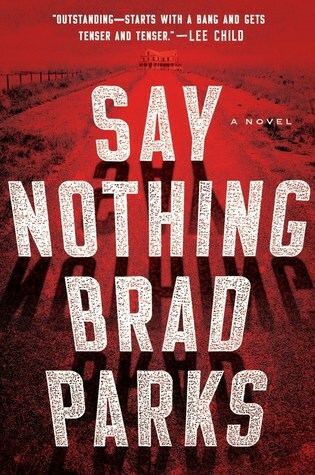 What do you hope readers take away from Say Nothing? Eight hours of breathless entertainment and the urge to hug their loved ones just a little tighter. 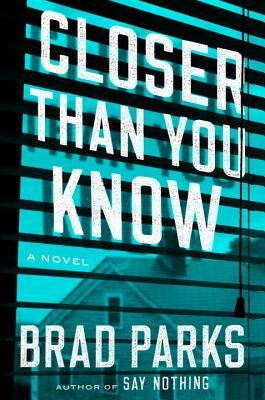 Brad Parks delivers another riveting, emotionally powerful stand-alone domestic suspense thriller perfect for fans of The Couple Next Door and What She Knew.Disaster, Melanie Barrick was once told, is always closer than you know. Until one Monday evening when she goes to pick up Alex from childcare only to discover he's been removed by Social Services. And no one will say why. It's a terrifying scenario for any parent, but doubly so for Melanie, who knows the unintended horrors of what everyone coldly calls "the system."